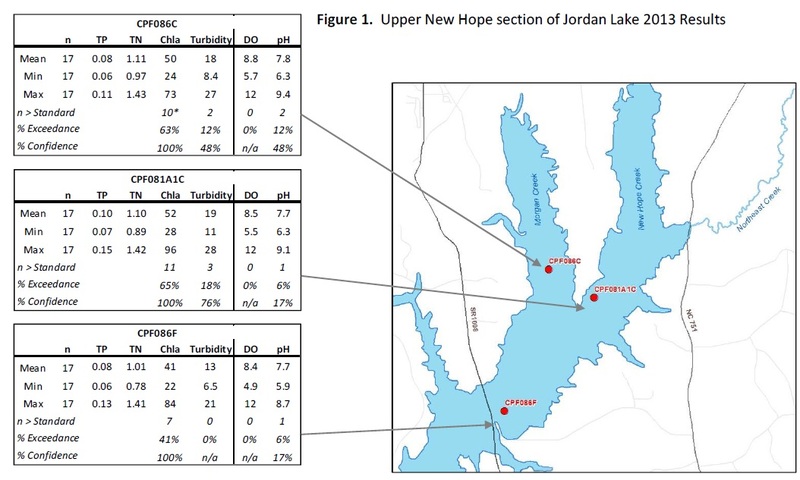 Even with NC Division of Water Resource’s burdensome workload (e.g., Coal Ash crisis, added legislative mandates, and budget cuts) the Division managed to put out its 2013 annual Jordan Reservoir monitoring report. Like previous years, 2013 water quality did not look good. Standards were violated for low oxygen, high PH, and turbidity. The above data were more than enough justification to keep the lake on the State’s 2014 list of impaired waters. The State has been sidestepping full implementation of an existing clean-up plan for the lake. This past legislative session saw a 3-year delay added to many elements of that plan. In lieu plan implementation, the legislature added funding for an experimental low-cost technology – water aerators, that DENR is currently trying to get permitted for deployment. As water quality data shows, however, the devices will have their work cut out for them if Jordan is to be removed from the State’s impaired waters list.